Great Start! FREE on KINDLE – “The Recluse Storyteller” – 2 more days! 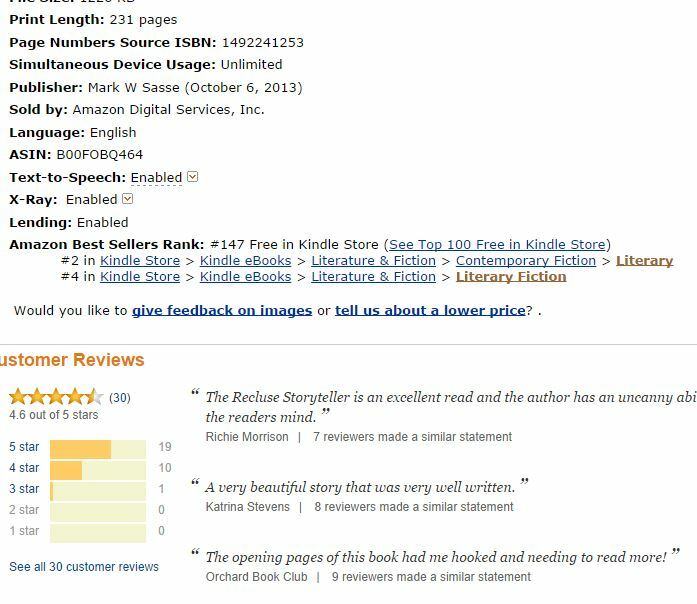 My second novel, The Recluse Storyteller, is having it’s longest and most effective FREE DAYS ever! It’s been steadily climbing the Amazon Free charts for the last two days and has rested at #147 by the end of the second day. If you haven’t done so yet, please pick yourself up a copy and share with your friends before it’s too late. I’m very excited about getting it into as many hands as possible. READ REVIEWS AND GET A FREE VERSION HERE! This entry was posted in Promotion and tagged free kindle books, indie author, KDP, kindle free, kindle promotion by sassevn. Bookmark the permalink.